I am pretty excited at the moment, it's my Birthday on Friday and I'll be turning 20, it is quite bizarre. I honestly don't feel my age at all, I'd say I'm quite a big kid at heart and probably always will be. I have no plans at all for my Birthday, I hate planning everything out just in case I get let down so I'll just go with the flow, I'll probably end up going on a shopping trip with my best friend for the day and have a big buffet of food when I get home. I'm completely clueless as to what I am getting for my Birthday, I haven't told anyone what I want yet so it's a mystery but I'll do a Birthday haul post after if any of you like reading those kind of posts. 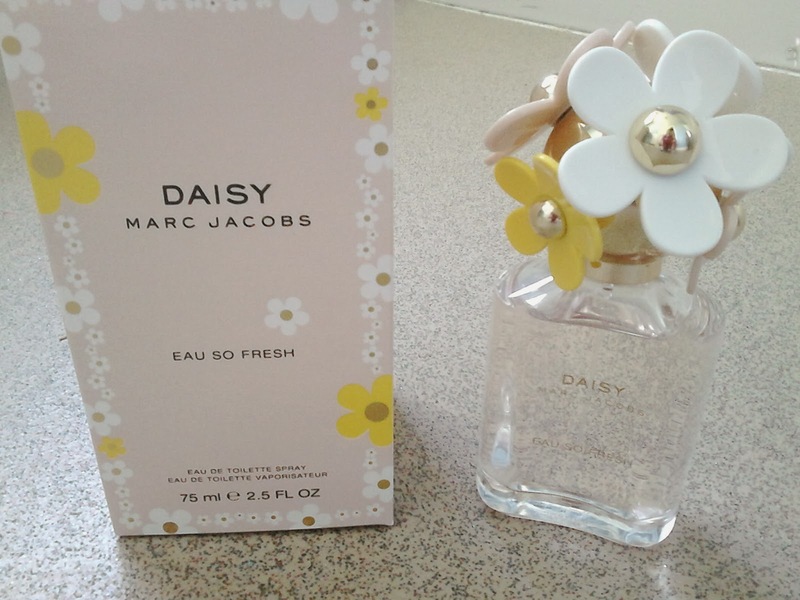 Anyway enough about me and my birthday, as promised on my last post I will be revealing all about my new-found favourite fragrance, Marc Jacobs Daisy Eau so Fresh. I was casually looking around Boots last month(as you do) when I had no money in my pockets and came across all the Marc Jacobs fragrances in the fragrance/makeup aisle and this particular perfume instantly caught my eye. How could it not? The perfume bottle is a very sturdy colourless glass bottle with slightly curved sides but I have to admit the bottle isn't what attracted me to it at first. The sphered shaped lid looks so beautiful covered with yellow, pink and white daisies made of rubber. It would look so pretty on a dressing table(if only I had one). The scent itself is just amazing! 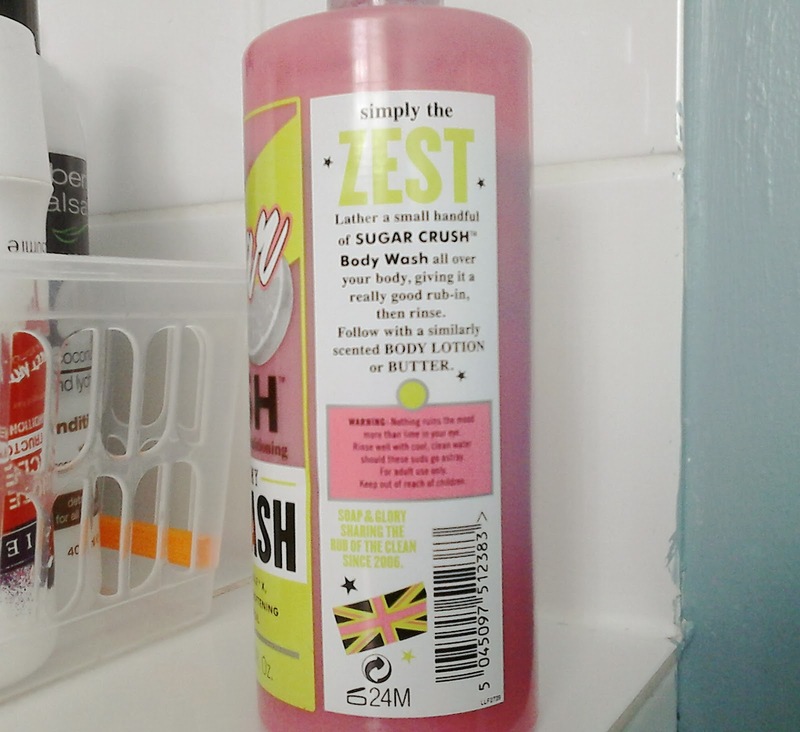 I don't know how to describe it but I'd say it's a very fruity/floral scent which I absolutely love. 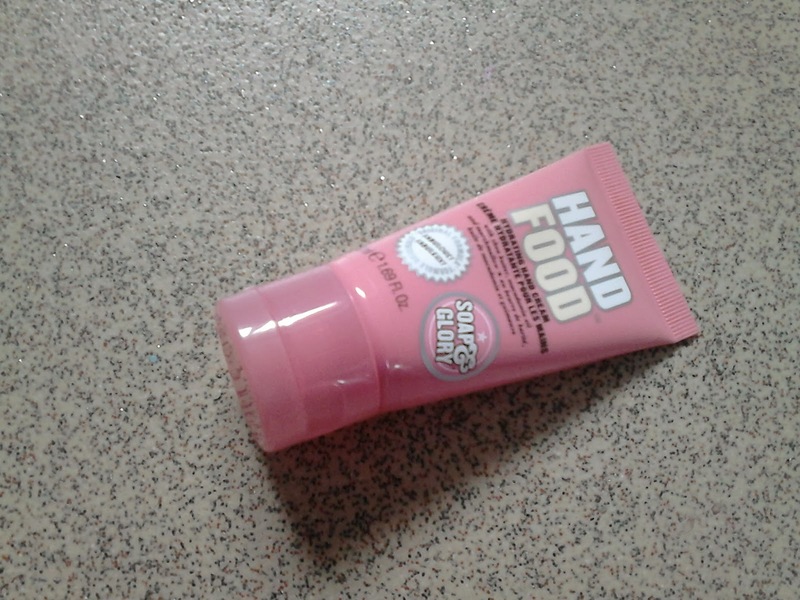 It's not a very overpowering smell, it smells quite subtle and fresh and you can definitely tell when you're wearing it. This perfume has a combination of both fruit and floral scents with top notes of Ruby Red Grapefruit, Raspberry, Green Leaves and Pear. 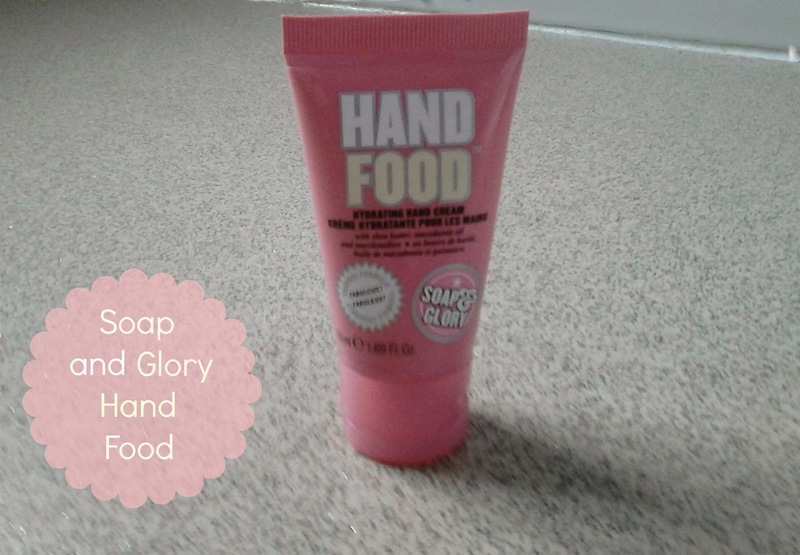 Middle notes of Violet, Wild Rose, Apple Blossom, Lychee and Jasmine petals. And Base notes of Musks, Plum and Cedarwood. You only need at least one-two spritz of this perfume on the wrist or neck as the scent lasts quite a while on the skin. 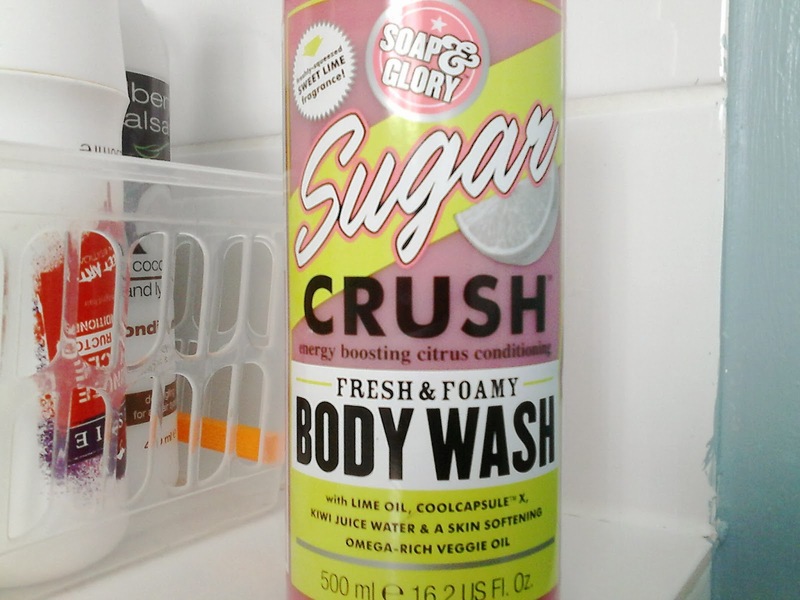 As it's quite a fresh, fruity scent it is absolutely perfect for this Spring, I have been using it non-stop. I highly recommend this to any of you ladies that are on the lookout for the perfect fragrance this Spring, it truly is the most stunning perfume I've bought and I'm so glad I let go of the money to purchase the little beauty. You can purchase various different versions of this perfume, it comes in a 75ml bottle(which I have) for £65, a 125ml bottle for £85 and a purse spray for just £29.50 from Boots online here. I am thinking of purchasing the purse spray version as I like to keep perfume handy when I am staying at a friends or on holiday. 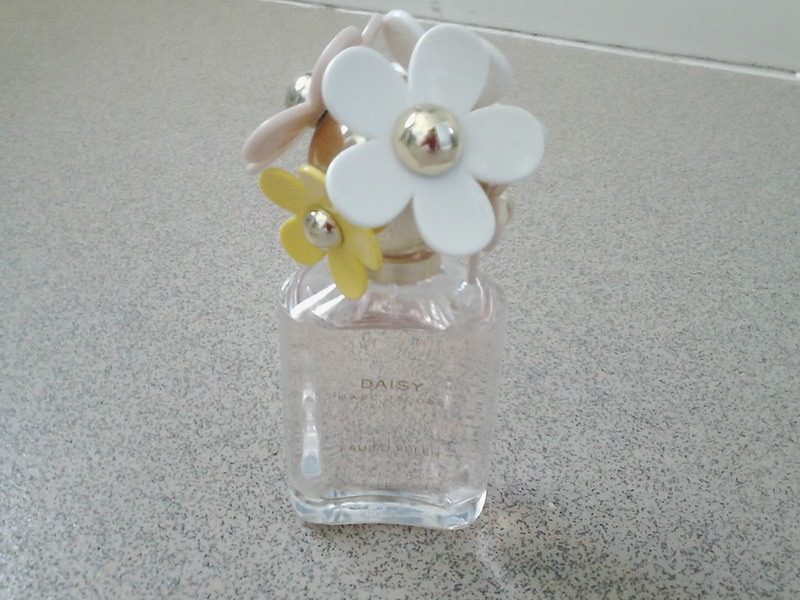 Have you tried Marc Jacobs Daisy Eau So Fresh? It is now February(doesn't time go fast?) and a very special ocassion is coming up. It is my birthday on the 28th of this month and I turn 20 which I am quite excited about, I really don't feel my age though, it seems like only yesterday that I left school. As always I don't have a very big wishlist, just a few little things that I've been wanting for a while, a few beauty products and clothing. 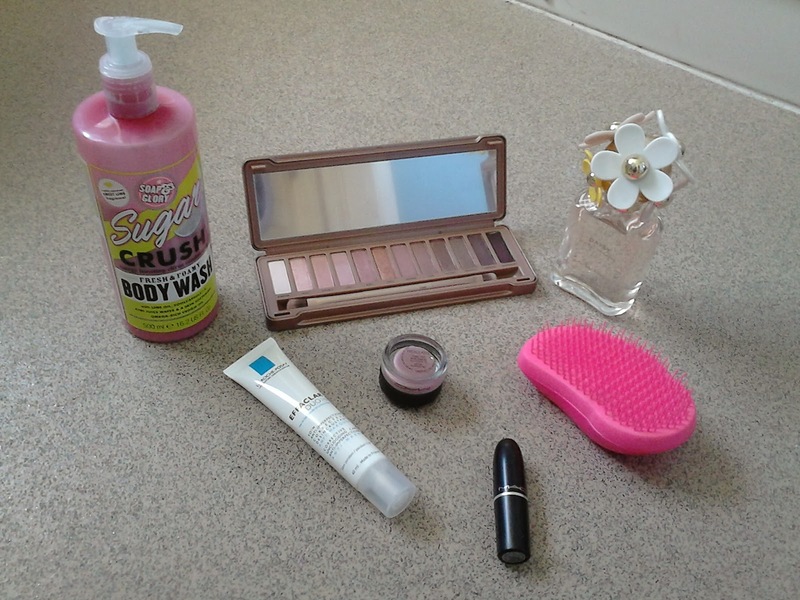 I do have a few other things in mind but the products shown are at the top of my wishlist for my Birthday. 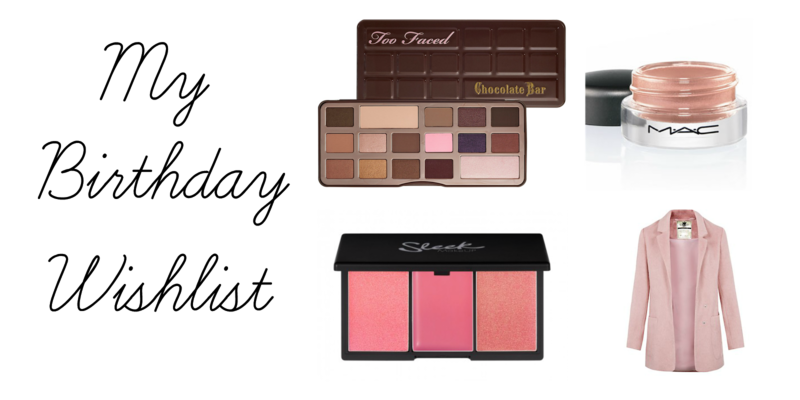 Shamefully I have to admit that I do not own any Too Faced products whatsoever so this would be a great start to my collection. 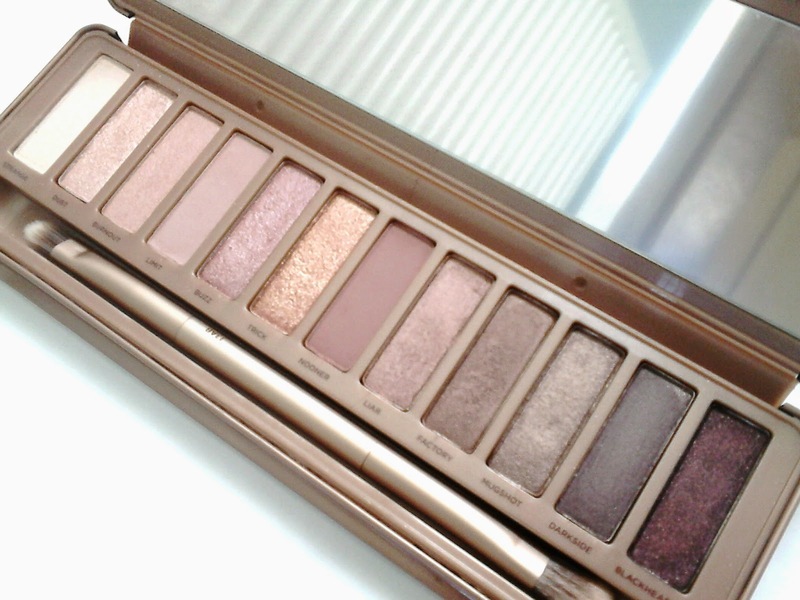 I have seen a tonne of the reviews and swatches of this palette all over and oh my, they look so pretty. 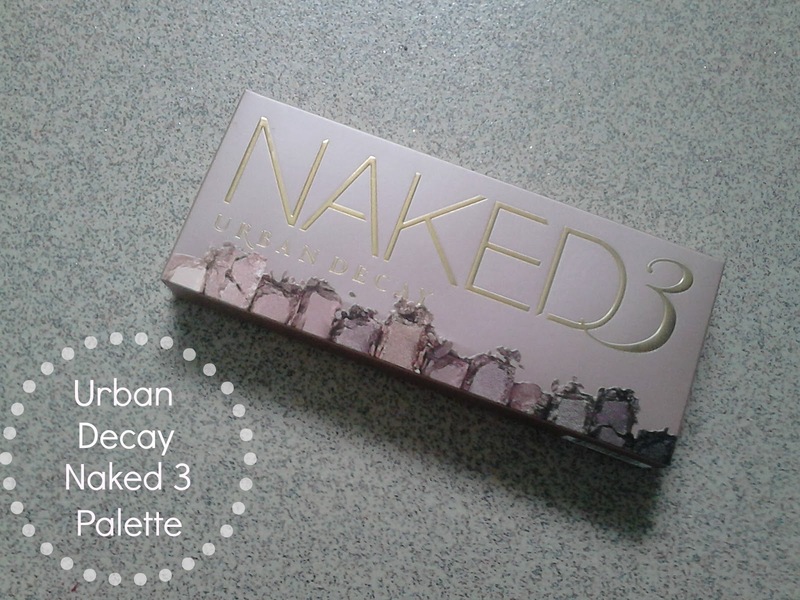 It is a little expensive for a palette at £45.00 but it's currently 12% off at Debenhams here for £39.50 which isn't too bad. Don't you like the chocolate bar design though? 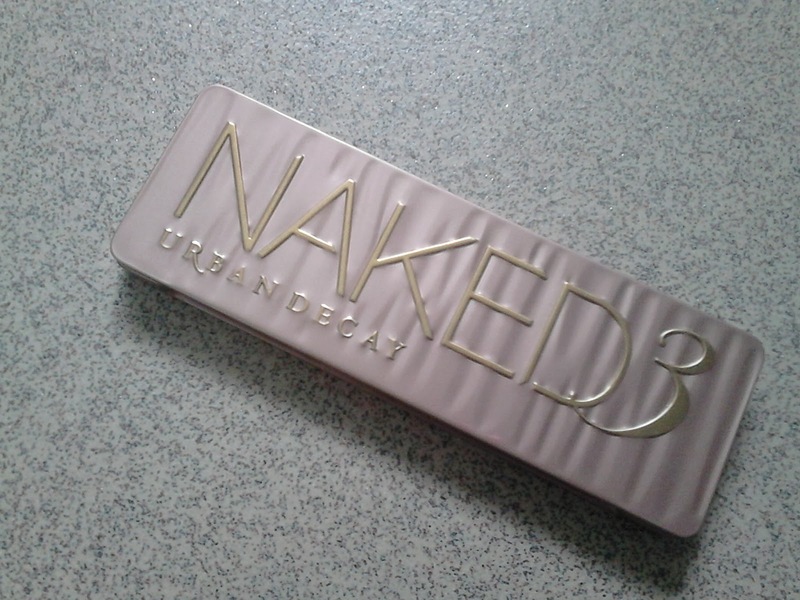 Aghh, I love it! I have a huge love for MAC products especially their lipsticks and MSF so it was only right that I want to try the paint pots. I really want 2 different shades at the moment, Painterly and Let's Skate, they look so pretty. They're £15 each here and at your local MAC store. A while ago Sleek MakeUP released 2 more Blush by 3 Palettes called 'Pink Lemonade' and 'CALIFORN.I.A' and I absolutely love the first option. 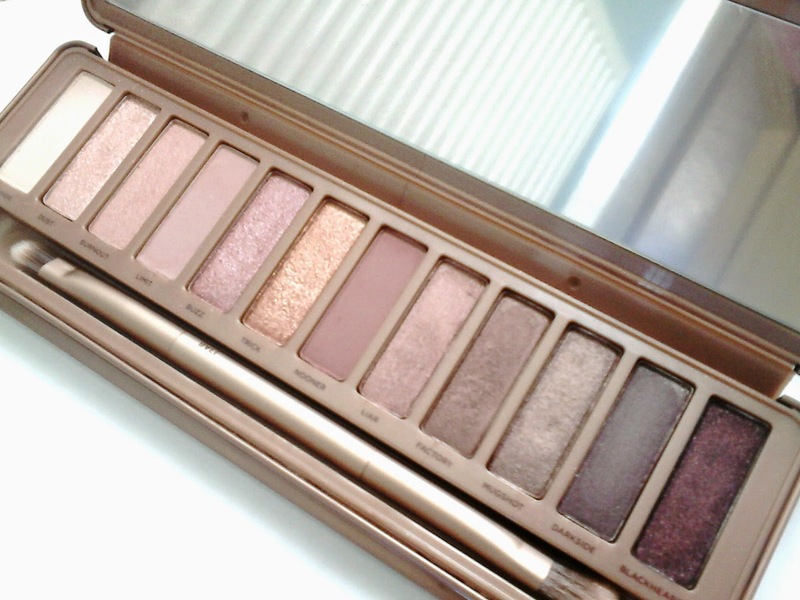 The palette includes 3 beautiful shades, I can see myself using it a lot if I was to get it for my Birthday. 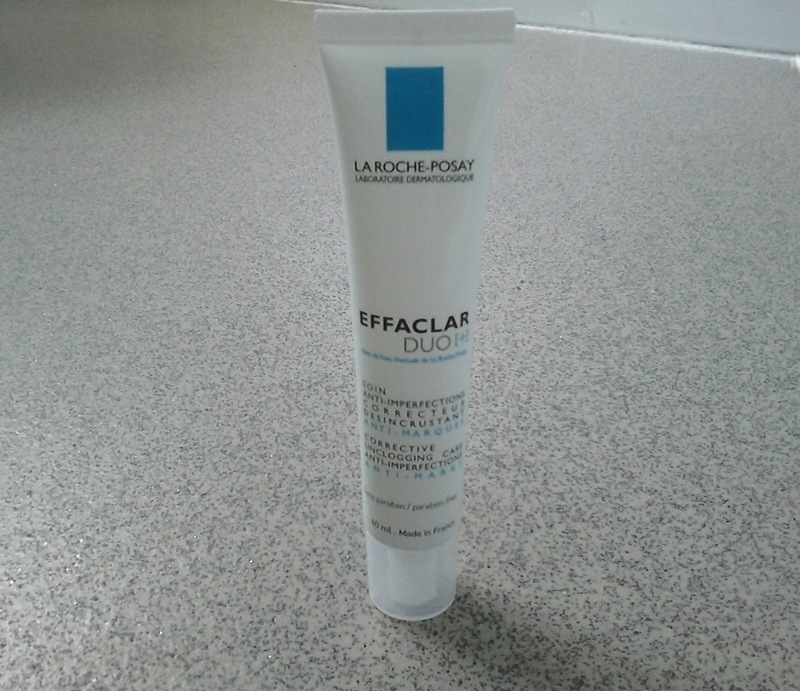 You can purchase it online here at Boots for just £9.99. 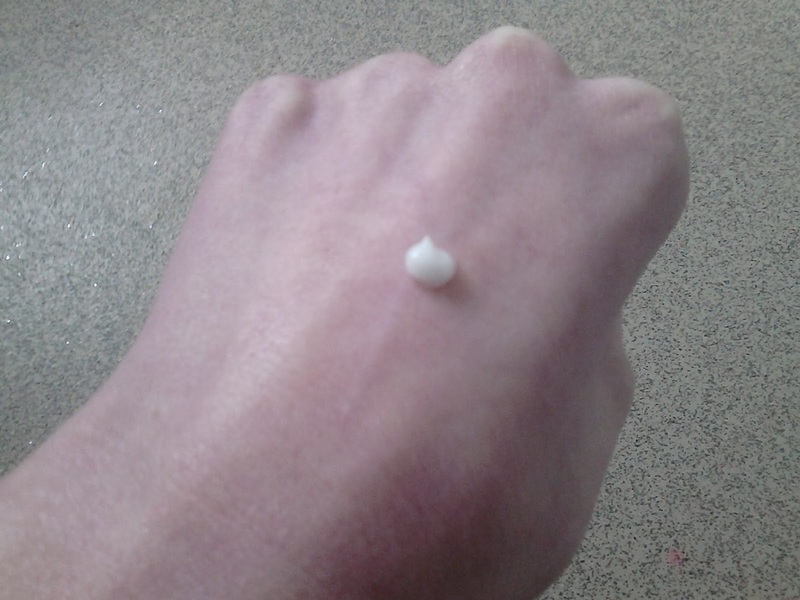 Okay, so I only got a new coat a month ago and I already want a new one. Why? well it's a pretty coat, do I need a good reason.It's a lovely pastel pink colour and it feels so soft. I spotted it in New Look a few weeks ago and I love it, I have absolutely no idea why I didn't just buy it at the time, I'm not sure if they have any of my size left anymore. It's £54.99 both online and in store. Is your Birthday coming up? What's on your Birthday Wishlist this year? I absolutely love a little shopping spree! I'm sure most of you lovely ladies do too. I just love the thought of adding new things to my makeup collection and I have now got a pretty extensive collection of lip products, oops. 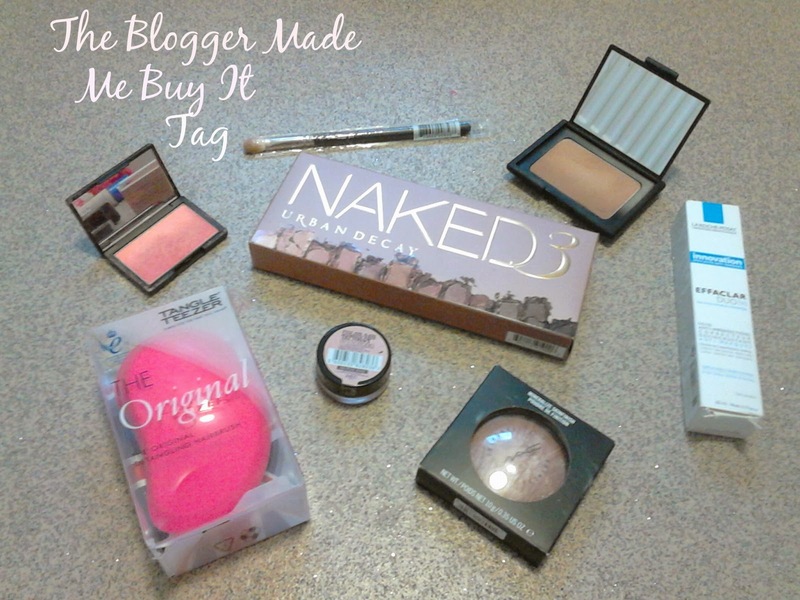 As soon as I like something it's popped into my basket without a second thought and boom, it's paid for and ready to be used but due to my extensive collection some of these products I'm showing you haven't had the chance to be used yet. I have to admit I was unsure on purchasing these at first but I decided to follow the hype and purchased 3 different shades from Boots in October sometime. 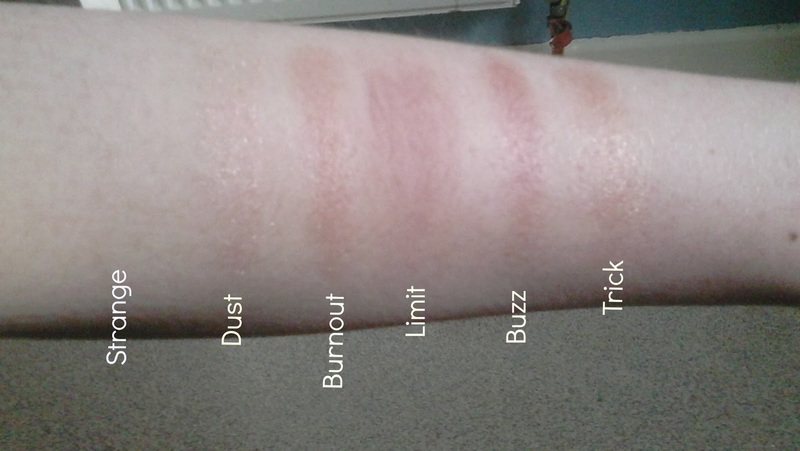 Altogether there are at least 21 different shades, some of which are new, you can purchase from your local Superdrug or Boots store for £7.99 each. Boots currently have a 3 for 2 deal on all Revlon cosmetics. In January these little beautys were released into our local stores and I couldn't help but purchase 3 of them due to their 3 for 2 deal. 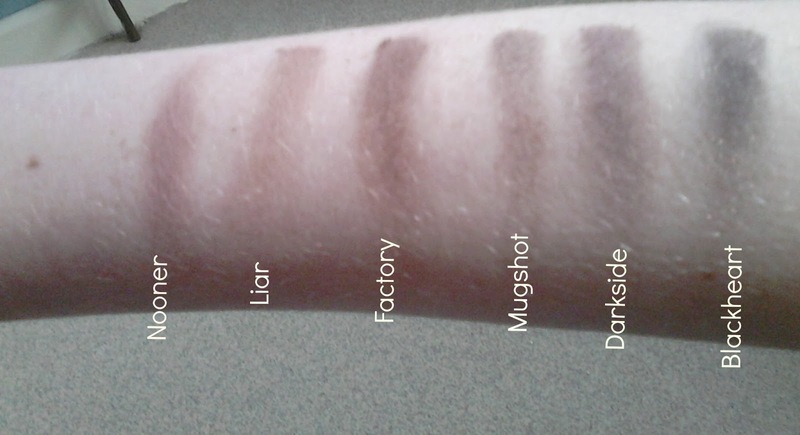 I only received them last week as I ordered them online and I'm yet to try them out but oh my, they look lovely when swatched. As you probably already all know by now I haven't got a local MAC store so I always purchase via the MAC cosmetics website. 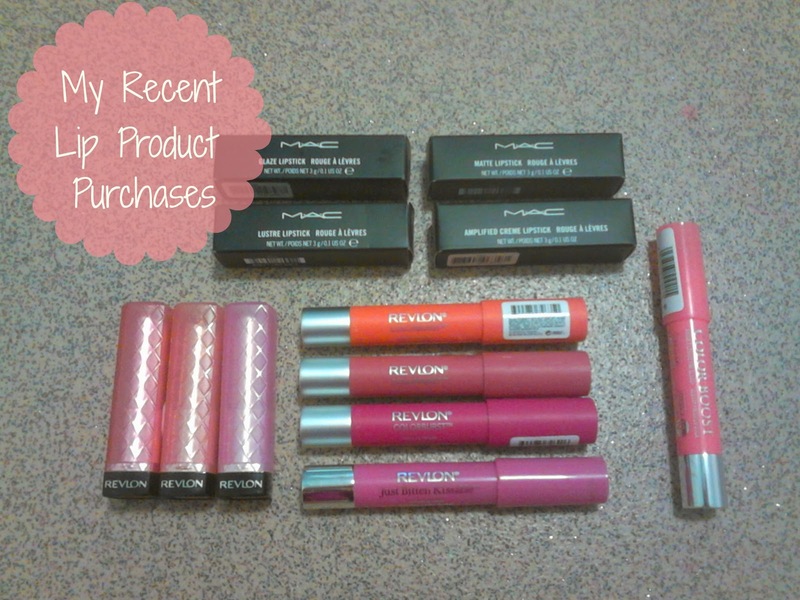 Throughout the last couple of months I have made a fair few lipstick purchases, I probably have at least 7 or 8 different shade and formula MAC lipsticks now. 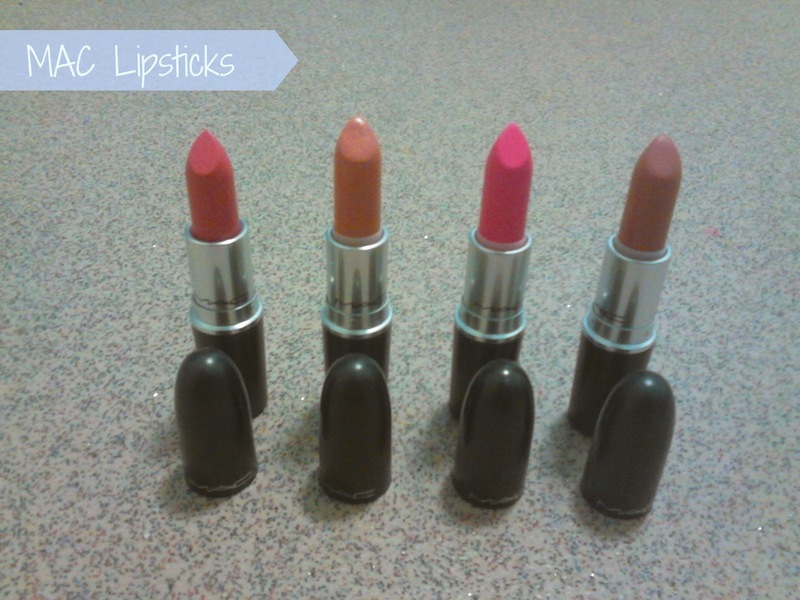 Every MAC lipstick has a different formula/finish such as lustre, cremesheen, matte, frost, glaze, cremesheen pearl, amplified and amplified creme. 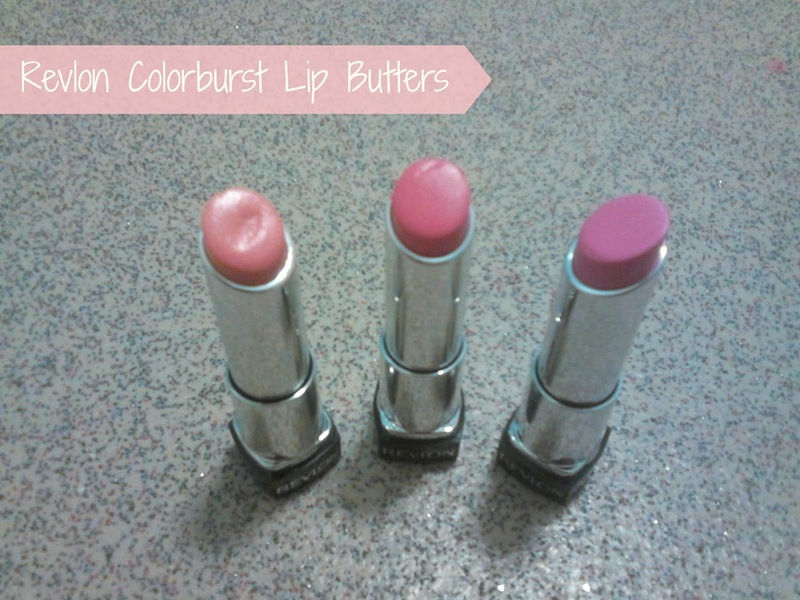 As you've probably noticed from this post I have got a slight obsession with lip crayons, I absolutely adore them. It took me a while to get on the Bourjois Color Boost hype but I finally picked one of them up in the most popular shade 'Peach on the beach'. 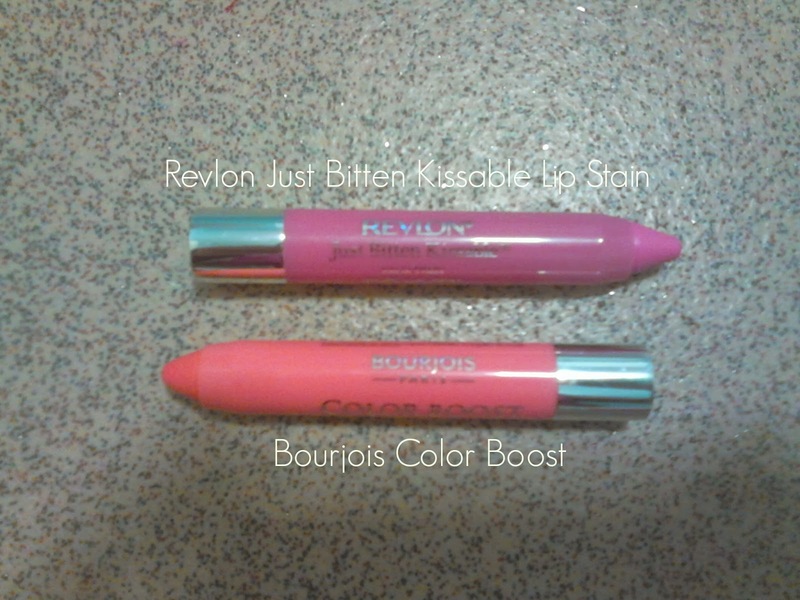 I also got the Revlon just bitten kissable lip balm stain in the shade 'Cherish Devotion', it's a gorgeous baby pink colour. 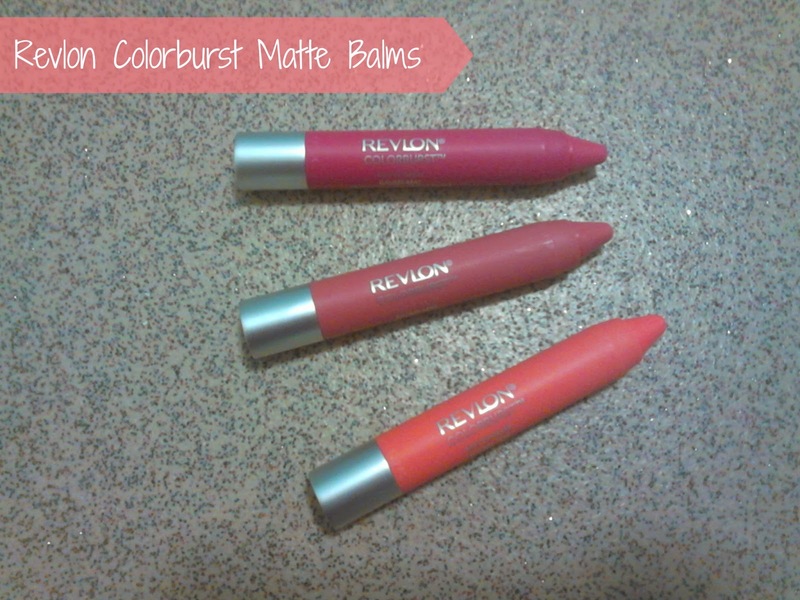 You can pick both the Color boost lip crayon and Revlon just bitten kissable balm stain from Boots or Superdrug for £7.99. If you would like to read a review on any of the products shown above let me know in the comments below please! As you may or may not know after many of my rants on twitter I haven't been up to blogging for the last week or so as I came down with a really nasty stomach virus, urgh, not pretty. 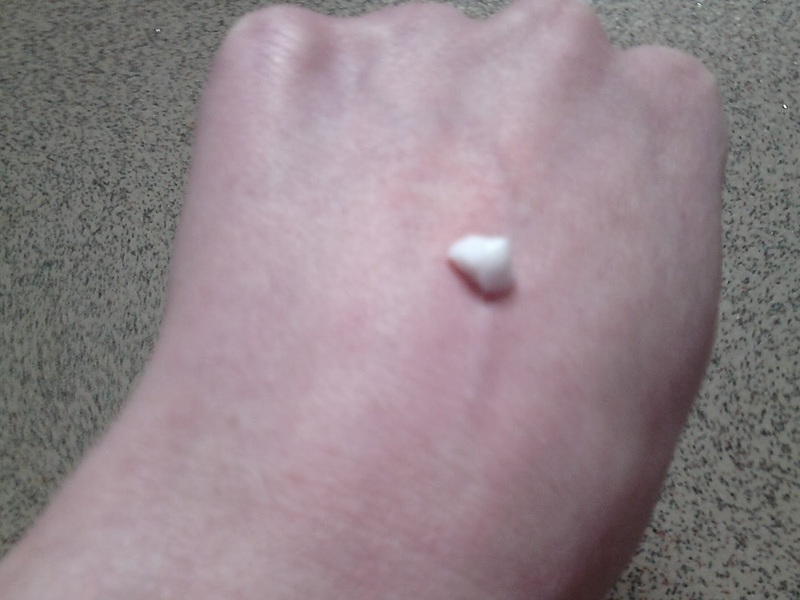 If you've had it before then you know how disgusting I have been feeling, I'm slowly getting my appetite back and I'm getting back down to business (well, with my blog anyway). Anyway, forget all that, I don't want to be feeling sorry for myself. 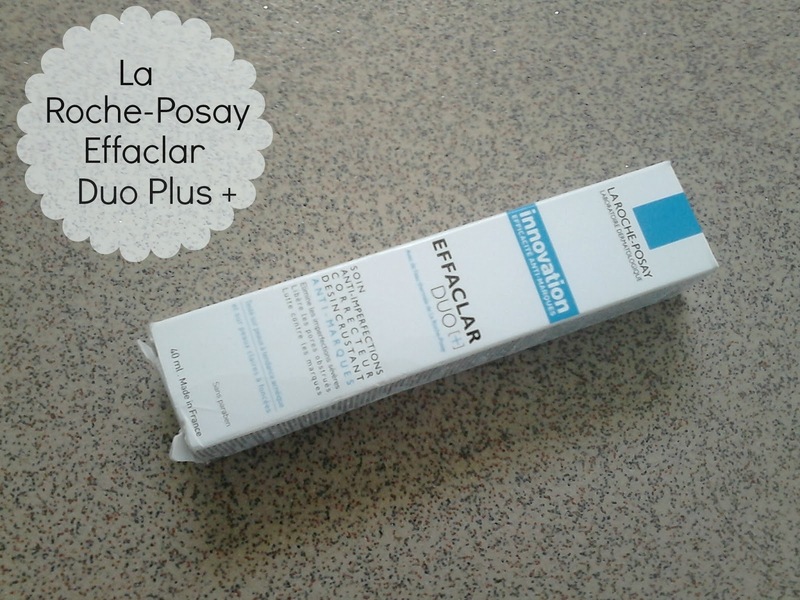 I have finally got this post up. 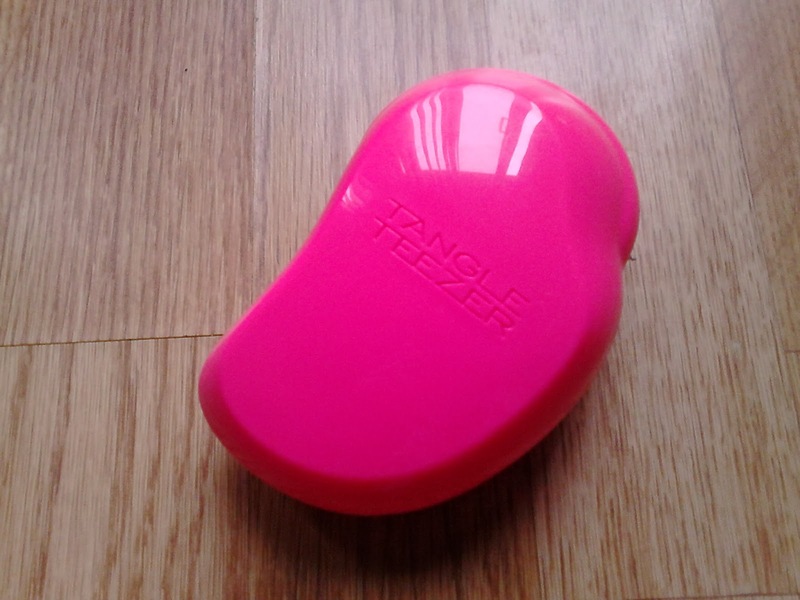 I was meaning to last week but obviously I hadn't got round to it so here we are girls, my personal review on the original tangle teezer. 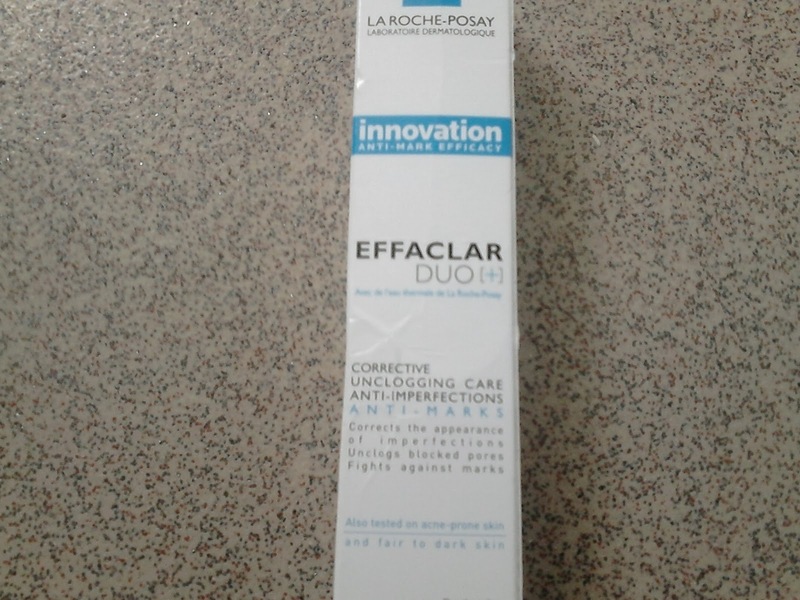 For months I have been deliberating about getting this little beauty and then I gave in a few weeks ago when I spotted it in Boots on a little shopping trip with my best friend. I have been meaning to get it for ages but I always thought it was a bit expensive for a hairbrush, but the tangle teezer is not just any ordinary hairbrush. I have always suffered with terrible knotty hair, especially in the morning and this works so well at detangling without pulling and causing damage, it makes such a huge difference to my hair. 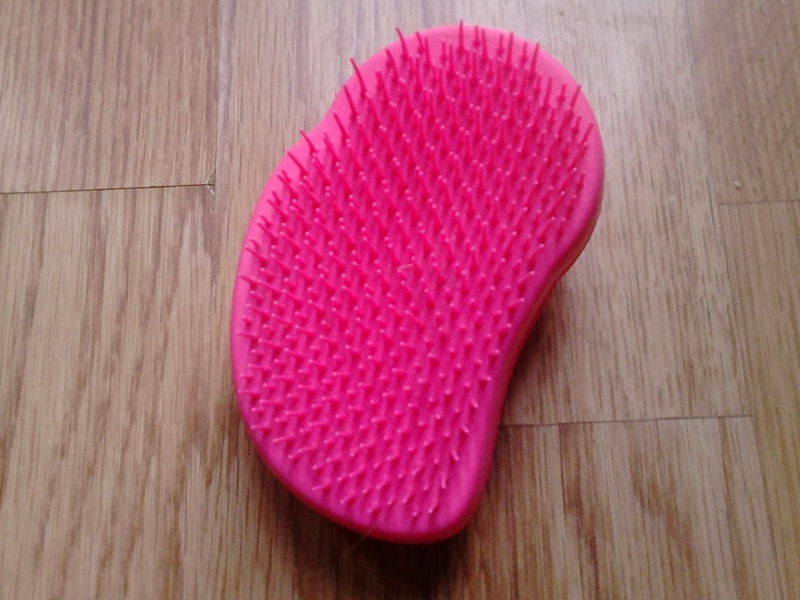 What I love most about the tangle teezer is that you can use it on both wet or dry hair, I'm no longer yanking and pulling hair out, phew, no more pain. After using the tangle teezer my hair looks shiny, sleek and incredibly smooth, it has actually now become a holy grail product of mine. You can also get the original tangle teezer in various different colours such as purple glitter, green, orange but I bought it in Pink as it's my favourite colour, I'm such a girly girl. There are also a variety of different tangle teezers other than the original such as the compact styler, the magic flowerpot detangling hairbrush and aqua splash. The Original Tangle Teezer is currently priced at £10.99 in Boots and Superdrug in the UK or you can also purchase directly from Tangle Teezer.